Providing the best auto experience doesn’t stop with the sale at INFINITI of South Mississippi. We want to help you maintain the high grade of your vehicle by supplying top-notch auto servicing and repair. Whether your vehicle requires a simple oil change or a trip to the collision center, you can trust our professionals to take good care of you and your vehicle. Your INFINITI is a vehicle that is exceptionally superior in craftsmanship and drive, and it is our duty to ensure that it remains that way. Our dealership offers optimal service and repair for your INFINITI so that you can take pride in your vehicle, no matter how many miles it’s driven. We also make the latest specialized technology and precise analysis easily accessible to you. Since INFINITI are constantly improving, we believe that it is necessary for our technicians to undergo regular, frequent training to ensure that they’re always up-to-date on every single component of your vehicle. Whether you’re in search of a routine servicing or a major repair, you can count on our technicians to expertly fulfill your service needs. By bringing your vehicle to our dealership, with every single mile, you can expect a driving experience unlike any other. Schedule your service appointment with INFINITI of South Mississippi today. 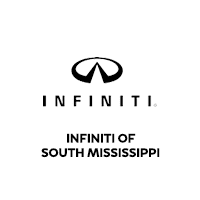 INFINITI of South Mississippi	30.452375, -88.9019059.